With the increasing frequency of pelvic surgeries taking place, there lies an inherent risk of developing sinus tracts. The authors describe a case in which surgeons excised a parauterine sinus tract. A 28 year old woman presented to our institution with abdominal pain and discharge from the sinus tract since one year. Her previous surgeries included two cesarean sections, a laparoscopic appendectomy, a unilateral oophorectomy for ovarian mass and drainage of right iliac abscess. CT scan and sinogram showed a parauterine sinus tract extending up to the rectus sheath. On laparotomy these findings were confirmed with dye test and sinus tract was excised after dissecting planes surrounding the uterus. Excision of sinus tracts in and around the uterus requires meticulous dissection and knowledge of surrounding anatomy especially in cases with prior multiple surgeries. Preoperative and intraoperative tracing of the sinus is vital to its successful excision. Obstetricians and pelvic surgeons are confronted with patients with multiple previous surgeries which include cesarean sections. This poses a risk for injury to pelvic organs as well as formation of sinus tracts and fistulas. Pelvic sinus tracts can be located between the skin and either the bladder, bowel or the uterus. Parauterine sinus tracts are uncommon and the excision of these requires surgical precision and knowledge of surrounding anatomy. The authors describe a case in which surgeons excised a parauterine sinus tract. A 28 year old woman had two previous cesarean sections and a laparoscopic appendectomy. Subsequently, a year ago, she presented to our institution with abdominal pain. 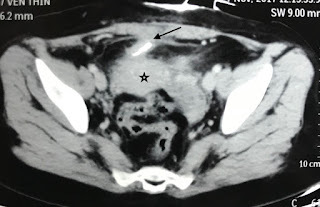 Investigations revealed a right ovarian mass and a right iliac fossa abscess. 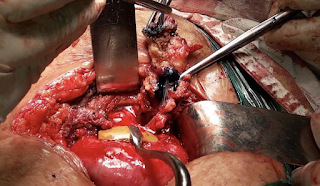 She underwent an exploratory laparotomy with right oophorectomy and transperitoneal drainage of the right iliac fossa abscess. Histopathology of this sample was not done. Thereafter she complained of abdominal pain and discharge from the incision site. After experiencing these complaints for a year, she came to our department. Inspection of her abdomen showed multiple scars of previous surgery which included a transverse 5 cm scar, two centimeters above symphysis pubis and three laparoscopic scars for appendectomy; one infraumbilical (1 cm) scar for primary port and two (0.5 cm) for secondary ports. The authors noted a 2x2 mm opening on the anterior abdominal wall at the center of the suprapubic transverse scar. Per vaginal examination did not reveal any forniceal scarring, pain or induration. However the uterus appeared to have restricted mobility possibly due to adhesions of prior surgeries. An ultrasonography of the pelvis showed a sinus tract involving the anterior abdominal wall. CT scan revealed a parauterine sinus tract extending from the skin and ending in the parametrium and a subsequent sinogram confirmed the same (figure 1). She was counseled for surgery and a written informed consent was taken. She was placed in dorsal position after spinal anesthesia. Methylene blue dye was mixed with hydrogen peroxide in a 10 mL syringe and injected into the tract with the help of an intravenous cannula. Hydrogen peroxide is taken to penetrate the tissue in cases of deep sinus tracts. Dissection of the anterior abdominal wall was done around the sinus tract leaving a space of 2 cm around the tract. Uterus was held with Shirodkar’s uterus holding forceps. The sinus was traced along its path and was found to extend upto the lower uterine segment and around the right border of the uterus into the parametrium. It ended abruptly here and this was confirmed with the absence of methylene blue dye. The entire tract was excised. An intraabdominal drain was placed within the pouch of Douglas. At the end of the procedure the urinary bladder was filled with methylene blue dye in a retrograde manner and no leak was noted. Closure of the abdomen was done with polyamide 1-0 suture material after achieving hemostasis (Figure 2). The wound healed well with no evidence of residual sinus tract. Histopathology was consistent with sinus tract with granulation tissue. Figure 1. CT Sinogram shows the distal part of the sinus tract extending into the parauterine tissue (arrow). Dense adhesions and fibrosis are also noted surrounding the uterus (star). Figure 2. The excised parauterine sinus tract is demonstrated (arrow) with an infant feeding tube passed through it. Sinus tracts can develop from repeated surgery due to the increased chances of infection and risk of injury to pelvic organs. They may also occur from reduced immunity or in patients on immunosuppressive therapy. Communications between viscera and the skin can be prevented with meticulous primary closure of the uterus and the anterior abdominal wall as well as prevention of sepsis. Mycobacterial species are one of the more common causes in the Indian subcontinent. Treatment of a sinus tract include an adequate antibiotic cover and excision of the tract itself. [2,3] For those involving or located around the uterus it is important to identify neighboring organs, namely the urinary bladder and bowel. Frequently these are adherent to the uterus and pose a challenge during dissection. Blunt dissection with the tip of a suction cannula helps without damaging vital structures. Parametrial tracts require mobilization of the uterus and delineation of the fallopian tubes and ovaries. Care must be taken to avoid the uterine vessels and ureter especially in cases of dense fibrosis. Excision of sinus tracts in and around the uterus requires meticulous dissection and knowledge of surrounding anatomy especially in cases with prior multiple surgeries. Preoperative and intraoperative tracing of the sinus is vital to its successful excision. We acknowledge the help of Dr Raviraj Tiruke MD, Assistant Professor in Obstetrics and Gynecology and Dr Sadashiv Chaudhary MS from Department of Surgery, Seth GSMC and KEM Hospital for their help and assistance during the surgery. Das P, Ahuja A, Gupta SD. Incidence, etiopathogenesis and pathological aspects of genitourinary tuberculosis in India: A journey revisited. Indian J Urol. 2008;24(3):356-61. Athanasias P, Krishna A, Karoshi M, Moore J, Chandraharan E. Uterocutaneous fistula following classical caesarean delivery for placenta percreta with intentional retention of the placenta. J Obstet Gynaecol. 2013;33(8):906-7. Thubert T, Denoiseux C, Faivre E, Naveau A, Trichot C, Deffieux X. Combined conservative surgical and medical treatment of a uterocutaneous fistula. J Minim Invasive Gynecol. 2012;19(2):244-7.